Buying an infrared camera is a big commitment. Even though prices have fallen dramatically over the past few years, you want to make sure that you’re getting the best value for your money and choosing the camera that will serve you well over the long term. For some, cost will be the driving force, while for others, key hardware or software features are more important. Whatever camera you choose should, of course, offer quality and dependability, along with excellent technical support and service. There are a lot of choices in thermal imagers, ranging from affordable point and-shoots to highly specialized HD-level science and research cameras. Finding the right fit for your needs can seem daunting. So along with the twelve things in this booklet to consider, you’ll find it helpful to define what you’re going to use the camera for and the work environments where you’ll be performing inspections. Do your research on where thermal imaging technology is headed and the potential career and business opportunities on the horizon. In other words, think beyond your current needs to ensure you’ve done your best to future-proof your IR camera investment. If your specialty is weatherization, maybe all you need is a simple, lower-cost point-and-shoot IR camera to spot missing insulation, poor weather stripping, and leaking windows. If you’re an energy auditor, you may want a more advanced model that helps you generate professional, customized reports, or one that allows you to send images via a Wi-Fi mobile device to an agency that subsidizes improvements. Perhaps you need the benefit of higher resolution thermal imagery to help you build a strong marketing campaign for your services. Or you’re a restoration or HVAC contractor who needs a camera that links to moisture meter data to better-quantify the extent of damage or to track down condensation problems and coolant leaks. Predictive maintenance professionals also have a variety of needs that determine the kind of IR camera they should consider. A utility troubleman may only require a simple point-and-shoot camera to check for energized equipment before performing repairs or for doing quick inspections of connections. Another member on his crew might need a high-resolution thermal imager to scan substations and power lines from a safe distance as well as gather detailed and accurate temperature measurements. Facility maintenance personnel and electricians might benefit from a camera that provides flexible ergonomics, allowing them to comfortably point the imager around tight corners, down behind motors, or straight up for equipment inspections overhead. #1: Buy an infrared camera with the highest detector resolution/ image quality that your budget allows. Most infrared cameras have fewer pixels than visible-light cameras, so pay close attention to detector resolution. Higher resolution infrared cameras can measure smaller targets from farther away and create sharper thermal images, both of which add up to more precise and reliable measurements. Also be aware of the difference between detector and display resolution. Some manufacturers will boast about a high resolution LCD and hide their low resolution detector when it’s the detector resolution that matters most. For instance, LCD resolution may spec at 640 × 480, but if the IR detector pixel resolution is only 160 × 120, or 19,200 pixels, then the greater display resolution accomplishes absolutely nothing. The quality of the thermal image and its measurement data are always determined by the detector resolution. Higher resolution thermal imaging not only provides more accurate quantitative results, it can be very effective in showing findings in finer detail to customers, supervisors, repair crews, and insurance companies which can help move along the decision-making process for improvements and repairs. Superior IR image quality is also valuable for generating clearer reports and for marketing your services. #2: Need to present findings to others? Find a system with a built-in visible-light camera outfitted with an illuminator lamp and a laser pointer. There’s no need to carry a separate piece of equipment to take photos when many affordable IR cameras now include a built-in 3 to 5 megapixel digital camera that simultaneously captures visible light and thermal images. Digital photos that correspond to your IR images will help you further document a problem and communicate its precise location to decision-makers. So, if your customer or supervisor needs to see a comprehensive report, you’ll definitely want a thermal imaging camera with this feature. And be sure it includes an onboard lamp that doubles as a flashlight to illuminate darker areas. Built-in laser pointers are also invaluable, especially for isolating the location of a target surrounded by similar-looking components, such as breakers, or for pinpointing problematic energized electrical equipment where you need to keep your distance. Laser markers show up clearly on visible light pictures to provide a reliable reference. They’re also indicated on IR images as well as the thermal camera’s display so you’ll be confident you’ve captured all the necessary information. #3: Select a camera that delivers accurate and repeatable results. Infrared cameras don’t just let you see differences in heat, they let you measure those differences, which means the accuracy and consistency of the measurements is a very important factor when determining the value of a camera. For best results, look for a thermal imager that meets or exceeds ± 2% (or 3.6°F) accuracy. All FLIR cameras maintain that minimum standard, made possible by the company’s ability to manufacture its own thermal imaging detectors. But that’s not the only criteria. In order to produce correct and repeatable results, your thermal imager should include in-camera tools for entering both “emissivity” and “reflected temperature” values. An infrared camera that gives you an easy way to input and adjust both of those parameters will produce the accurate temperature measurements you need in the field to make the best call. Other helpful diagnostics to consider are multiple moveable spots and area boxes for isolating and annotating temperature measurements that can be saved as radiometric data and incorporated into findings for reports. As you become more experienced with your infrared camera, these features will become more meaningful. But before you proceed with your buying decision, find out whether the thermal imager you like offers these capabilities. #4: Look for an IR camera that stores and outputs standard file formats that are broadly supported. Many infrared cameras store images in a proprietary format that can only be read and analyzed with specialized software. Others have an optional JPEG storage capability that lacks temperature information. FLIR, on the other hand, has the distinction of offering a standard JPEG with full temperature analysis embedded. This allows you to e-mail IR images to your customers or colleagues without losing that vital information. Radiometric JPEGs can also be imported from Wi-Fi compatible cameras to select mobile devices using apps that provide further image editing, analysis, and sharing. After all, you shouldn’t have to waste time converting images. Request a demo from the infrared camera manufacturer and have them show you how the camera you’re considering will output JPEGs without a bunch of extra steps. Also, look for infrared cameras that allow you to stream MPEG 4 video via USB to computers and monitors. This is especially useful for capturing dynamic thermal activity where heating and cooling occurs rapidly and for recording motorized equipment or processes in motion. Some cameras feature composite video out for cabling to digital recorders while others include HDMI outputs. And new mobile applications have also been developed that allow streaming video over Wi-Fi. All these capabilities will help you share findings more effectively and enhance your infrared inspections and reports. #5: Consider the added value of an IR camera that links to Bluetooth-enabled T&M meters for assessing electrical load and moisture levels. New test and measurement tools like Extech MeterLink products now allow certain thermal cameras to measure more than temperature to fully quantify the severity of moisture damage and electrical issues. These moisture and clamp meters wirelessly transmit vital diagnostic data such as humidity, amperage, voltage, and resistance directly to the camera. The data is annotated automatically to the thermal image and embedded in the radiometric JPEG to support IR findings. This provides extremely valuable information to help you determine the urgency of a problem and decide on the best solution. #6: New Wi-Fi apps for mobile devices help streamline the sharing of thermal images and data; select a camera compatible with this leading technology. It’s now possible to connect cameras like FLIR’s E-Series and T-Series to an Apple iPad, iPhone or iPod wirelessly. The unique FLIR Viewer app, for example, lets users import IR images to the mobile device for portable analysis, report generation, and sharing. The advantage of being able to send thermal images and IR inspection reports via Wi-Fi from one part of a facility to another or by email from the field is huge, especially when time is of the essence. New apps are in development for more mobile platforms and for additional functionality such as remote camera control, streaming video, etc. #7: Make sure you get a camera with the ergonomic features that make your job as easy as possible to match the way you like to work. The camera’s weight can be a significant concern if you’ll be using it frequently or for extended periods of time. 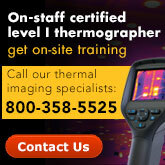 A lighter thermal camera will decrease strain on your shoulder and back during long inspections. A wide selection of compact, light point-and-shoot thermal cameras are available at surprisingly affordable prices and fit nicely into tool boxes and utility belts and pouches. Some models like the FLIR T-Series have lens systems that tilt along a 120 degree axis allowing users to keep the viewing screen comfortably in front of them while rotating the optical block straight up or down to scan hard-to-reach targets – perfect for a day full of overhead bus duct inspections, looking behind motors, under work stations, and aiming from other challenging angles. Another important thing to consider is the camera’s interactive controls. Does it have dedicated buttons, direct-access menus, both? An extra button or two can actually make the camera easier to use as opposed to using one button to step through a maze of menu options. Buttons should be intuitively positioned and comfortable to use. Some cameras offer integrated touch screens as another advantageous way to access functions and features, including text and sketch notations. And make sure your camera is outfitted with at least two batteries (Lithium ion or better) that can be quickly and easily switched out in the field so you can keep working efficiently. #8: Picture-in-Picture (P-i-P) and/or image fusion will allow you to combine thermal and visible-light images for generating reports that are easier to understand. P-i-P allows you to inset a box to place a thermal image over its corresponding visible-light photo. This lets you clearly communicate the location of a problem to customers, colleagues, and repair crews. Advanced infrared cameras also feature “image fusion”, which lets you blend the visible and thermal images together into a composite. This allows you to choose exactly how much of the photo you need to reveal behind the thermal image. You can use this feature to highlight an anomaly within a given structure—say a specific blockage in a long run of pipe. Fusion can produce compelling evidence for both documentation and repair purposes. #9: Not all reporting software products are created equal: Be sure to try out the product first to find the one that’s right for you. Reporting is an indispensible feature in an infrared program or business. Clients, from individual home owners to large corporations, require documentation of your findings. Thermal image and report data can be a key element in a wide range of applications: energy audits, electrical inspections, gas detection surveys, building envelope analyses, and predictive maintenance programs. They’re often used to initiate insurance claims and substantiate restoration repairs. Today, most infrared cameras come with free software that allows you to perform basic image analysis and to create simple reports. Advanced software programs for more in-depth analysis and customizable reports are also available, allowing you to take full advantage of your camera’s capabilities and features. Create instant reports right from the camera, or on your mobile device with Wi-Fi enabled cameras. IR analysis software can perform a wide range of tasks from simple spot measurements to custom radiometric calibrations, and can also create specialized data analysis using third party software like MatLab™ or Excel. Software packages designed for a range of specific applications – from building inspection to advanced research and development – are also an option, and these tailored software programs may make the most sense for your business. #10: Choose a thermal imager with a wide temperature range so you can measure ambient and high-temperature spots in the same image. A camera’s temperature range and sensitivity are important considerations, too. The range tells you what the minimum and maximum temperatures are that the camera can measure (-4°F to 2,192°F is a typical example). Sensitivity tells you the smallest temperature difference between two objects that the camera can discern (0.05°C, for example). You should select an IR camera with a temperature range broad enough to capture all of the temperatures in the objects or scenes you typically encounter. Additionally, you should consider the smallest temperature difference you will typically want to measure and make sure you get a camera sensitive enough to resolve those differences. #11: Look for cameras with a comprehensive, extended warranty program to protect your investment for the long haul. Reputable infrared camera manufacturers want to make sure your thermal imager is going to serve you well for many years. That’s why some offer extended warranties. Programs like FLIR’s 2-5-10 warranty, for example, go a step further offering two years of coverage on parts and labor, five on its field-replaceable batteries, and ten on the IR detector. Whatever camera you choose to go with, just be sure it comes with a solid warranty that will give you peace of mind. #12: Make sure your investment in an infrared camera is backed by a strong manufacturer who will provide ongoing technical support and training. The quality of customer service and the depth of technical support available should be integral to your decision on which infrared camera to purchase. Not only is FLIR the world’s leading manufacturer of infrared cameras for commercial applications, it also founded the ITC, the world’s largest infrared training center. Make the most of your investment, advance your career, and enhance your value to your organization with an accredited certification. Professional photographers get extensive training and it shows in their work. The same is true for your craft as a thermographer, and ITC can help. An Infrared Training Center certification is written proof of your expertise in operating your camera and interpreting the thermal information it provides. Come to classes at our training center, locally at one of our regional classes, or in your facility with our on-site service. And be sure to take advantage of online training, too.